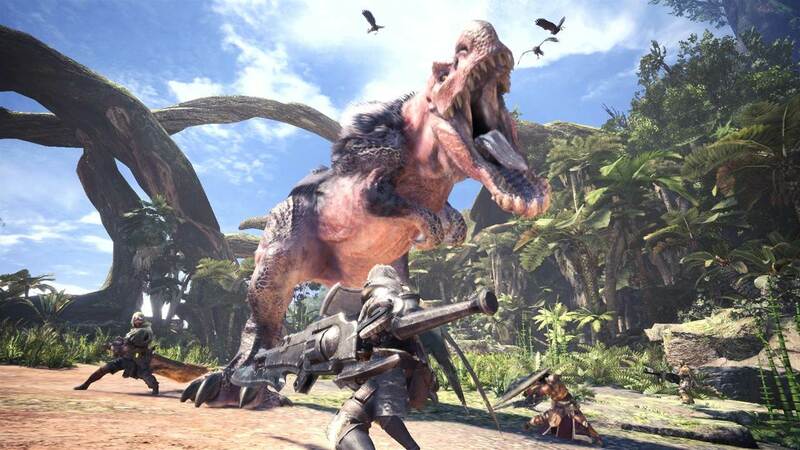 There was one hunt I participated in that made me understand the world’s fascination with Monster Hunter properly – one so exciting and tense I will never forget. The games have always been this way, but not as big or as beautiful as seeing it all on such a powerful platform. Within the Ancient Forest, I was out hunting an Anjanath. I had been fighting it for well over half an hour, and my Palico and I had taken such a beating, we were almost done. As he retreated temporarily up to a Rathian’s nest, we followed ready to put our final effort into his destruction. With the few potions I had, we closed in on his tracks and prepared to do whatever we could to kill him, but something both insane and helpful happened to us. Within the nest that the Anjanath had headed towards, the Rathian awoke and the two started to fight. It was brutal, loud, and fascinating to watch. Then, with one almighty swoop, the Rathian grabbed the Anjanath in its claws and flew high into the air. As he soared high above the both of us, the Rathian let go and dropped this humongous T-Rex from 200 feet in the air, doing a horrific amount of damage to him, and allowing us to put the final sword to the heart, granting us the victory, and letting us collect our prize. Once you get to grips with the game’s complex systems and lengthy battles, Monster Hunter: World is about as rewarding as it gets, and the game is filled with watercooler moments you’ll be sharing with friends for weeks and months to come. Of course, playing with friends makes all the difference. Teaming up isn’t particularly hard to do, and you can limit whether you want random players or just your pals via a password system. Make no bones about it, distracting a monster while your friend leaps onto it, straddling it and unleashing a barrage of attacks culminating in a kind of super attack that puts the monster down for a bit, allowing even more of a beating to take place, is incredible. Starting out just trying to find tracks of the beast you’re hunting together is the calm before the storm, but the eventual chase is just mesmeric, and there’s no question the game is better played with friends. But we’re getting ahead of ourselves a little. You play as a hunter from the Fifth Fleet sent to aid the Research Commission in the capture of an elder dragon known as Zorah Magdaros. The story is incredibly simple to grasp, and the structure is also basic, which both aids your gameplay and your progression. Equip your weapon, armour, and other items, then go into the field and hunt the next monster. Quests are relatively easy to find, and you’re also allowed to go on Expeditions, which are essentially opportunities for you to go out and gather items, hunt monsters not in one of the quests and earn more Research Points. There are 14 weapon types to choose from, and different armour sets you can craft or buy, depending on your style. It’s hugely important to try every weapon, or at least a wide range of them because they all have significant strengths and weaknesses. World doesn’t have a leveling up system for your character, which is refreshing: instead, you kill monsters and grab their remains to craft better stuff. Certain monsters have resistances to fire and ice, among other things, so it’s always important to read the stats at the Smithy. I started off using the hammer because it did lots of damage, and in the beginning the first few monsters are slow and relatively easy to take down. But as you get through each hunt, the monsters react differently to your presence, and have plenty of different attributes that you’ll need to adapt to. 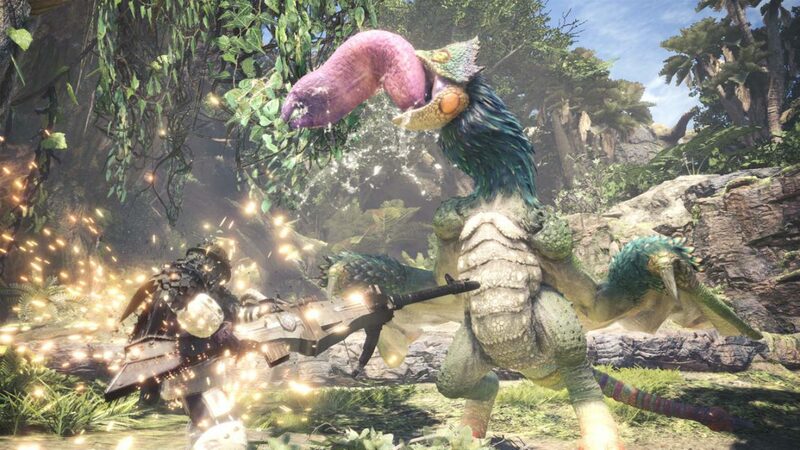 For example, the Tobi-Kadachi is a wyvern that can fly from tree to tree, charging its body until its electrified, and will fly towards you causing huge amounts of damage. It’s difficult to get in close because it’s fast, so even when it takes a breather, you can’t be guaranteed it’ll be back on the move and out of reach once again. I foolishly went in with the Gunlance (a strong sword doubling up as a gun) but the Tobi-Kadachi kept getting away. 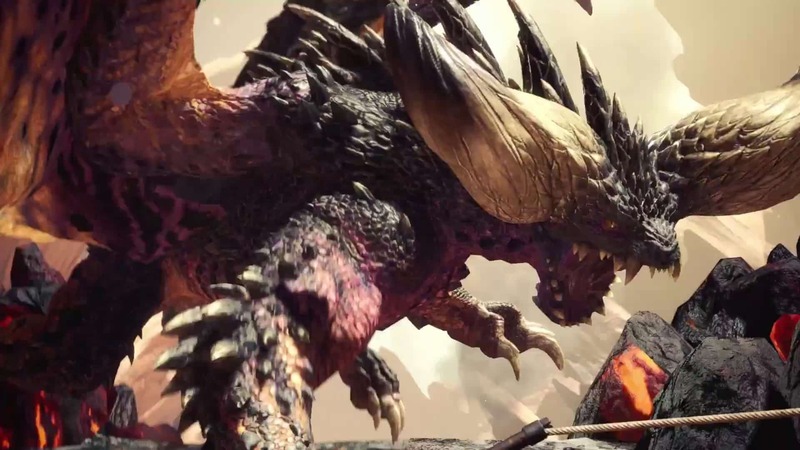 The Radobaan was much easier to battle with the Gunlance because a lot of its bonelike spikes that protruded from its body could be blown off with the gun, and the sword could do damage to its guts. As you fight each monster, they gradually get worn down, and body parts break off giving you some indication just how you’re doing, but generally you’re never sure how you’re doing until it visibly skulks away, and that’s when you know you’re close. It can become frustrating because you can spend more than 45 minutes a fight, and you can end up fighting the same creature a few times before you’re successful. There are no health bars for monsters, either, so you will need to study their form. They will turn tail and run when wounded, and when near death they might even start limping. These are fights that require you to understand your foe in order to overcome them. Your best bet is to tool up and use other items at your disposal like poisons and bombs, but again, you need to equip the right weapon to use these. The slinger is pretty handy because it allows you to pull down rock formations, throw bombs at monsters, and lets you swing around the environments. The bow is a favourite weapon of mine because of the variety of arrows you can craft. In fact, the Anjanath I talked about earlier was taken down solely by the bow – something I’m very pleased about. Crafting is a massive part of Monster Hunter and knowing just how to do this isn’t always clear. A lot of tutorials in the game aren’t as descriptive as they could be, and in the first 5 hours or so, frustration may seep in as you haven’t found out how much of the things you’ve picked up work. Spend time in the menus, take a good luck around the Tradeyard and experiment. Much of the game is what you make of it, and if you’re willing to spend time learning, you’ll find the gratification you deserve. You’ll spend a lot of the time in the Smithy, and it’d be well worth your time doing so. He’ll craft you new armour, upgrade weapons and armour, and forge new ones. Using Armour Cores is important, and you’ll get these by defeating monsters and completing bounties such as finding bugs, wildlife, or creatures within the different ecosystems. There are tons of things to pick up and collect, but everything serves a purpose, and there is a lot of things to find, but thankfully your Scoutflies are massively resourceful. They form a glowing green cloud that can help locate these resources and even monster tracks, mucus, or bits of their skin that may have fallen off whilst they lived their lives in the New World. Speaking of the New World, I’ve rarely seen such beautiful environments. Horizon Zero Dawn did it excellently, and Monster Hunter: World follows suit. The Ancient Forest is a deep jungle filled with all sorts of weird wildlife, but the Coral Highlands were a highlight for me: it looked like an underwater world without the water, so weird plant life and colourful corals covered the walls and the ground, while glowing blue flies filled the air, giving you the illusion that they were air bubbles. As for the monsters living within the different ecosystems: they are remarkable. So divine it can be difficult to go after them. I spent a lot of time observing their habits, and the way they lived within them, namely when I was using one of the Special Tools called a Ghillie Suit. Capcom has designed a game so intricate and lifelike that many other developers should take note. On PS4 Pro it’s worth noting that the performance mode boasts a reasonably solid 60fps at the small sacrifice of some visual fidelity. It’s a small price to pay for that higher frame rate, and one can only ponder how incredible it’ll look on a high-end PC. There are so many other elements to Monster Hunter: World that add so much to gameplay. The cat-like Palicoes feel essential to your success, mainly finding items for you, and distracting monsters so you can get a good hit in or two whilst their backs are turned. You can also give them new equipment and buy new bits and pieces for them. 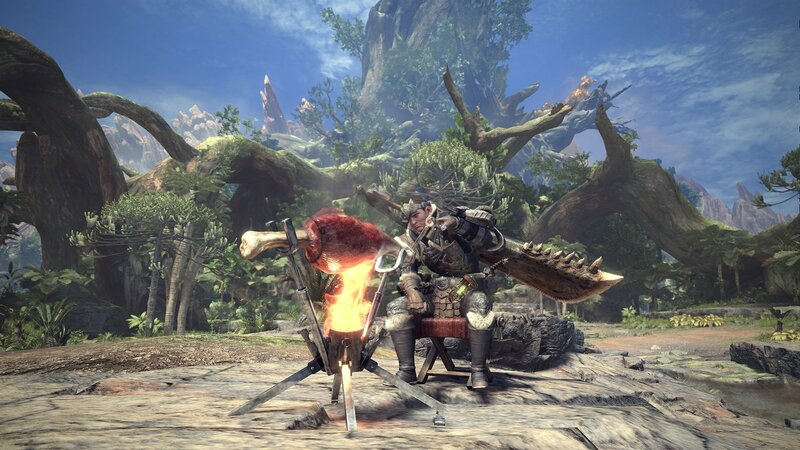 The canteen is also a great element to the game because the Palico chef will cook you up a special meal that’ll grant you extra boosts that’ll last for the duration of the Quest you’re about to embark on. The characters you’ll meet are generally two dimensional, and the voice acting is a bit hammy, but it doesn’t impact the game because the greatness of the hunt trumps all. 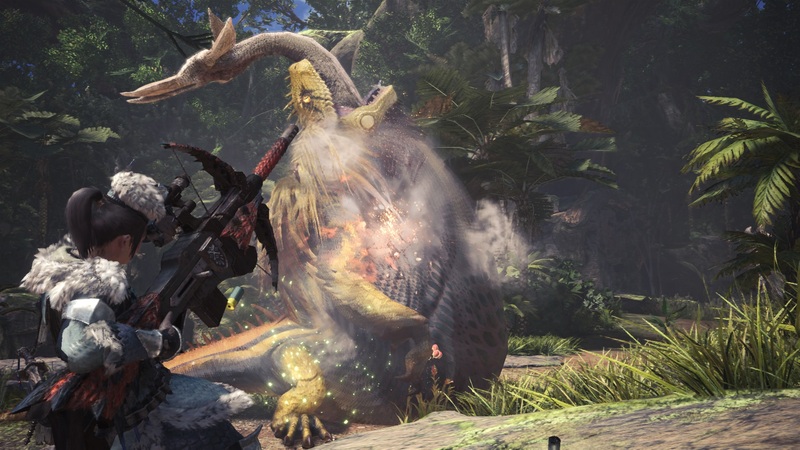 Monster Hunter: World is such an enjoyable game filled with lots to do, and although many of the systems aren’t explained as well as they should be, when you’re out in the different ecosystems hunting your next target, the satisfaction you feel after killing these monsters is a feeling few games manage to encapsulate. As it stands, Monster Hunter: World is a tremendously fun game slightly let down by the way it tries to explain its complexities. That said, if this is a series you’ve always been intrigued by, it’s by far the easiest to get in to. Finally we can all share the majesty of Monster Hunter, without losing the complexities that make it so unique. From the gorgeous visuals to the design in its monsters and ecosystems, Capcom has made the best Monster Hunter game yet. It's just a shame it doesn't help with its complex systems and occasionally poor explanations of them.